We are so happy that we decided on your company for our swimming pool. Everyone at your firm has been great to deal with. The pool turned out exactly as we had hoped. The price we paid was exactly the price quoted in our proposal. No change orders or surprises. is the one right in your family’s backyard! Adding a pool to your home is an investment that will last for years. That’s why your pool’s design and construction matters! 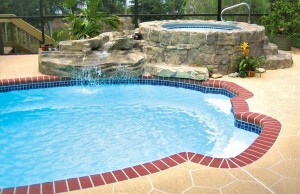 Because they do, when evaluating various Pensacola pool builders, you want to choose one with top-notch qualifications. With Blue Haven, you can choose from a broad range of gunite pool designs and decorative features. For pools in Pensacola/the Panhandle, some homeowner favorites include sloping beach entries, sun shelves for lounging in the water, colorful mosaics of sea creatures or sports’ team logos, planter boxes integrated into the poolscape, and natural flagstone coping accenting the pool perimeter. 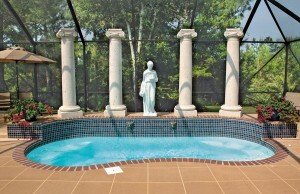 In addition, when it comes to picking out water features for your new pool design, we offer options for every taste and budget: sheer cascades, sleek deck jets, spouting statues, bubbler fountains, negative-edge pools, raised overflow spas, faux and natural stone waterfalls, and much more. In addition to building gunite pools, spas, and decks, we are a full-service Pensacola pool builder serving the entire Northwest Panhandle that offers many other exterior additions that can transform your outdoor space into a complete backyard resort. Amenities that pool buyers frequently ask for include retaining walls, screen-room enclosures, and complete backyard addition such as fire pits, walkways, pergolas, putting greens, and lattice patio covers. 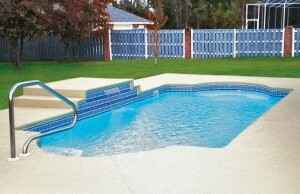 Pricing out a new custom pool and designing it to your specifications is a detailed process. That’s why we come out to your home for a thorough, no-obligation consultation. From the shape of your new pool & spa to options for swimming pool loans (oac), our pool-design team stands ready to help you embark on the exciting process of planning and building a new aquatic retreat for your family. So when you are ready to enjoy swimming, relaxing, and making the most of healthy backyard living whenever you want, give us a call. You can book an appointment with one of our friendly poolscape specialists, or ask for a free, 44-page, full-color brochure.